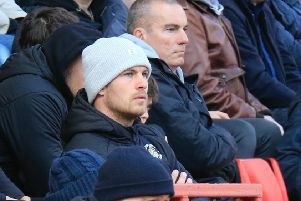 Town’s Glen Rea took absolutely no pleasure at all in his first ever goal in professional football at the weekend, as Luton were beaten 2-1 at home by Grimsby Town. The 22-year-old let fly from 25 yards to arrow a swerving drive beyond Mariners keeper James McKeown and into the bottom corner to bring his side level on the hour mark. I enjoyed it at the time as it got us back in the game, but we ended up losing the game, so I’m not enjoying it now to be honest. Although celebrating wildly at the time, the smiles were all gone once Rea faced the press afterwards, having seen Omar Bogle net a late winner to end Hatters’ unbeaten league record at Kenilworth Road. The Irish U21 international, who was on as a half time substitute for Olly Lee in a tactical switch by boss Nathan Jones, said: “It came to me on the edge of the box and I’m happy to get my first senior goal, but it’s not about the goals, it’s about the team and we weren’t at it, we lost the game, so we’re disappointed. “I enjoyed it at the time as it got us back in the game, but we ended up losing the game, so I’m not enjoying it now to be honest. Rea was quick to point out though he would swap any future goals for something that’s far more important to him, a shut out at the back. He continued: “It’s good to get my first senior goal, but I love defending, so I just want to keep them out. “If we kept a clean sheet it would have been just as good as scoring a goal. I’m a defender first and foremost, I want to keep the ball out of the net. Team-mate Johnny Mullins was impressed with Rea’s first goal though as he said: “It was a wonderful strike and I thought he was very good when he came on. “He gave us a little bit more solidarity in the middle and moved the ball well.